I often do weddings and funerals, and as part of the wedding or funeral people like a Keynote slideshow with 10-20 photos set to some background music. The problem is there may be other slides that need to come before or after it without background music. The easiest way to achieve this is to make a ‘movie’ of the slides (with a soundtrack) and then re-import this movie into a Keynote as a single slide. Here’s how to export a Keynote slideshow with a soundtrack. This Logitech remote has a volume adjustment button on the side. But if you change the volume the computer gives a loud ‘quack’ out the speakers, which in not good if you are in the middle of a presentation or a movie. Here is how to disable the volume change sound effect. There have been many times that I have been given a keynote file from someone, and I wanted to get a movie or picture out of it and save it as a separate file. Here’s how to do it. This is a feature that is sorely missing in Apple keynote. The ability to create a loop within Keynote. For example you may want have a loop of 4-5 slides at the start of a presentation while people are waiting, and then start the presentation without having to exit and open a new presentation. Or you may want to have a loop in the middle of a presentation, for example some photos that rotate while someone is singing, and then continue on with the presentation when you are ready. There is no way of doing this within Keynote itself but here is a workaround that will get you out of trouble. 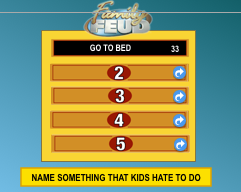 I wanted a ‘family feud’ style gameshow in keynote, but it was a bit complicated trying to make the right answer appear. I found the best way to do it was to have 25 slides with the different possible combinations of hidden/shown answers, then a heap of hyperlinks between various slides depending on what answer was picked. It worked out well. I’ve updated the files for Keynote 6.